The time is now to ensure your local constituency representative hears your opinion on the 8th amendment, and why it must be fully repealed. 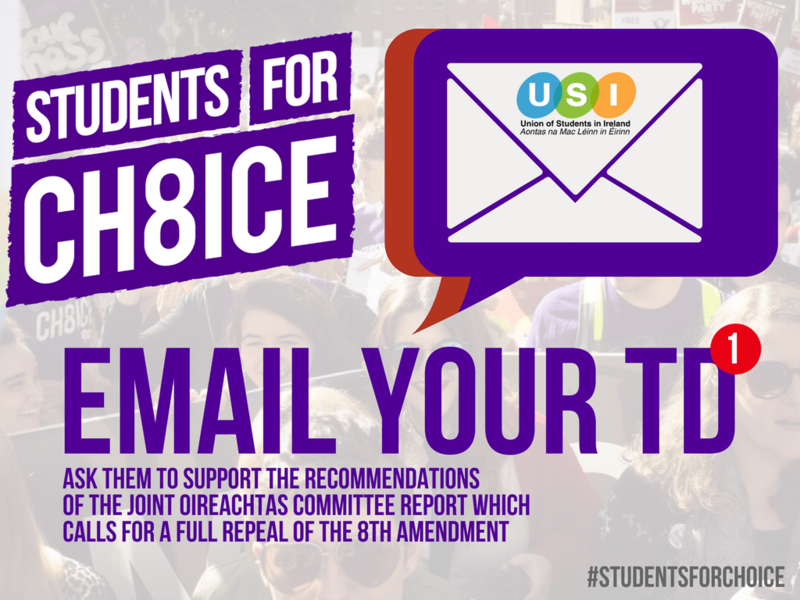 Students for Choice across Ireland are calling on TDs of all parties to consider seriously the important recommendations of the Joint Oireachtas Committee made before Christmas 2016, and to support them. Students for Choice are also making a clear call for a May Referendum 2018, to ensure that for the first time, we will have a vote on this issue. To get involved with the student campaign to repeal the 8th amendment, email equality@usi.ie. Personalise: Below is a draft email that you should personalise to your TD – for instance if you’ve interacted (positively) with them on any issue in the past, make reference to that. The less like a mass mail this is, the better! Think about it – if you received 100 of the same email you would read one and then probably delete the rest as they offer nothing new. Mass emails wouldn’t necessarily convince you, they would likely seem too contrived. If it’s personalised, it’s more meaningful. But lots of personalised emails about the same issue are very impactful, becuase they’re often seen as an indicator of public support or interest. Check where your TD is on the issue already: Before you email your TDs, check if they have voted recently on the issue here, or where publicly they have stated they are. Tailor your email then regarding that. I note that you have not made any public statements on the the 8th amendment, but I think it’s incredibly important for you to consider this as a matter of urgency for the people of our constituency, as so many families are affected every year, and we need to end the shame/silence etc. If your TD has expressed a pro-choice view/very clear stance: They’re just as important. Thank them for their work so far. Thank them for their support for this issue, and that you will help in the constituency any way you can, etc. Many TDs are under a LOT of pressure because of their stance and they need to feel supported going into this debate. A them to continue to be vocal in their support and to speak further with their party colleagues. If you’re a student representative, say what college you represent, and how many students. Mention the mandate on repeal that your collegehas, what % it passed by etc. If you’re involved in activism locally, mention that. If you or your family live near this TD or there’s another connection, mention that. Be respectful. Right now we need TDs to support this issue and to debate it respectfully in teh Dáil chamber, and that is more likely from interactions that they see as supportive and positive. If you have a personal story, consider mentioning it, or referring to a friend or someone you know who has been affected without naming them. Be clear about why this matters to you so much as a constituent. Don’t disclose anything that you’re uncomfortable with. Suggest a meeting – make yourself available to meet the TD at the end if they would like, so you can discuss the issue further with them. I am from __________ in County ___________ and vote in your constituency with my family. I’m also a student in ______________. I am writing to you to ask you to please support the recommendations from the Joint Oireachtas Committee on the Eighth Amendment which were published just before Christmas. The Committee recommended that a referendum be put to the people of Ireland to repeal the Eighth Amendment from Bunreacht na hÉireann. The Committee also recommended and outlined guidelines for legislation on the provision of abortion services to follow on from an eventual repeal of Article 40.3.3. I believe that the Committee’s recommendations reflect the wishes of a majority of the Irish people as reflected in research, opinion polls and the growth of a nation-wide social movement for repeal. I ask that you be open-minded, courageous and compassionate in considering this question and that you listen to the expert witnesses who came before the Committee. As a young person aged _______, I have not had the chance to vote on this issue. So, as a constituent of yours, I want to know: will you support the Committee’s recommendation for a referendum to repeal the Eighth Amendment and let the young people of Ireland have their say? The content of your email will be temporarily stored by USI but deleted on January 30th 2018. The TD will be able to respond to your personal email directly.